Nissan this month discussed new initiatives and benefits for its certified collision repair network, including greater accountability and the OEM sending shops warranty paint work starting Jan. 1. Nissan collision parts manager Mark Zoba’s announcement at SEMA drew applause from Collision Advice CEO Mike Anderson, whose company has worked with Nissan on another new element of the OEM’s three-year-old network. Certified shops will starting in December be able to take a two-day collision estimating essentials class developed by Collision Advice. 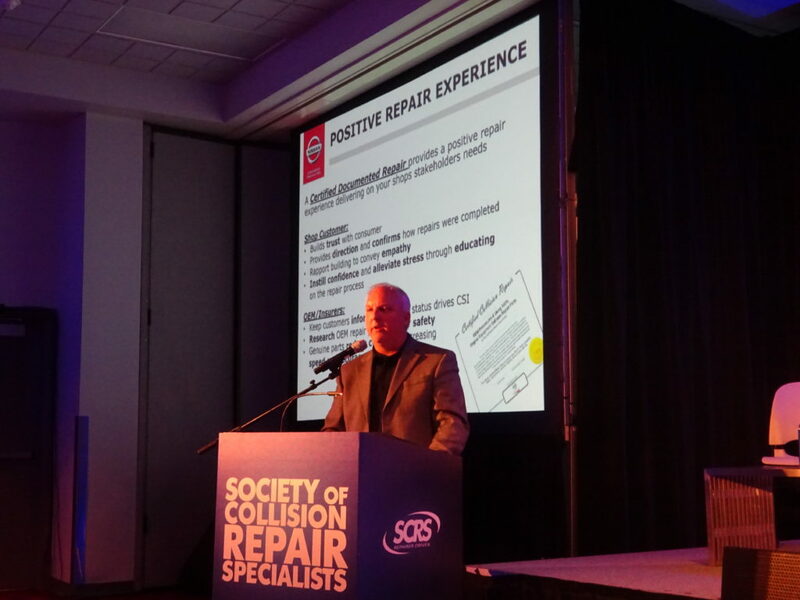 It will offer a “deep dive” on producing better Nissan and Infiniti estimates and using OEM repair procedures, according to a slide Zoba presented during SCRS’ Nov. 1 OEM Collision Repair Technology Summit. The expectation is that certified shops are using OEM repair procedures, Zoba said. The network gets a free subscription to Nissan’s $720/year OEM repair procedures website. Zoba said it might be a hurdle for shops to research repair procedures because of a lack of practice, but a repairer would get better by repeatedly accessing the database. He noted that the usage rate is “pretty dismal” among shops. Nissan also is launching a module with I-CAR to correspond with the next-generation 2018 Nissan Leaf, which went on sale this year. Zoba called the Leaf a “high-tech vehicle” with new technologies that would spread to other vehicles in the fleet. All network shops must take the class, and the rest of the industry is welcome to do so as well, Zoba said. Zoba highlighted the vehicle’s “e-Pedal” feature, which lets a Leaf owner drive and stop the car with just the accelerator. He said shops needed to be familiar with the technology and its calibration. By simply releasing the accelerator, the LEAF will come to a smooth and complete stop without the need to press the brake pedal. With a deceleration rate of up to 0.2g, the e-Pedal eliminates the need for drivers to constantly move their foot from the accelerator to the brake pedal to slow down or stop. This helps reduce fatigue and increase enjoyment. Studies by Nissan in Japan, Europe and the U.S. have shown that the LEAF’s e-Pedal reduces the number of times the driver must apply the brakes while commuting in heavily congested traffic. While the conventional brake pedal must still be used in aggressive braking situations, the e-Pedal lets drivers use a single pedal for more than 90 percent of their driving needs. For an electric car, the system also can have the benefit of reclaiming energy through the act of braking. The Leaf also comes with ProPILOT Assist, which behaves much like Tesla’s Autopilot, not to mention a longer-range electric battery than the old LEAF. Zoba said he asked network shops what they needed from Nissan, and they asked about training and what Nissan was doing to drive volume to their facilities. The automaker started to focus on both. 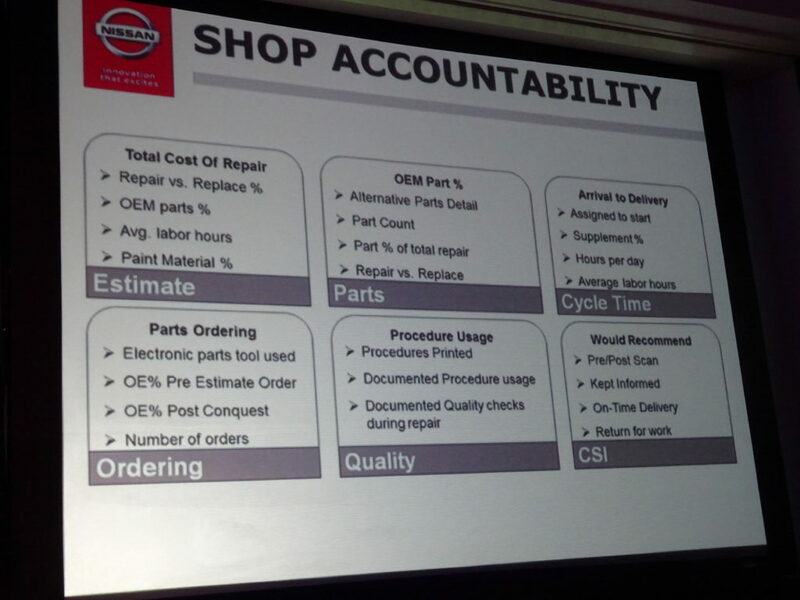 For 2019, the OEM sought to make shops more accountable, including with a “smart shop locator” which would prioritize facilities delivering repairs the way Nissan wanted, according to Zoba’s presentation. Certified shops failing to meet Nissan’s terms would be asked to step aside, he said. Nissan has 1,900 dealership and independent shops enrolled in its program, 1,536 of which were certified as of the last time Zoba checked. The OEM feels it needs about 1,650 nationally, Zoba said. Nissan is among the OEMs which caps its certified network. “We’re good,” Zoba said of his coverage. The next step will be to cull the network and cut poor performers, he said. Zoba also said that as Nissan connects more and more vehicles, it would direct customers to certified shops right from the moment of a collision. “We see that happening very quickly,” Zoba said, calling it the next thing for the pipeline. 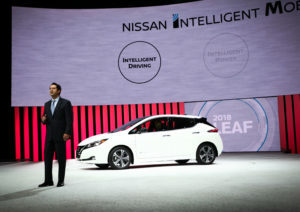 The OEM on Oct. 5 promised the “wide adoption” of NissanConnect in its fleet for the 2019 model year. The collision assistance feature is free for six months and rises to $8 a month for the first three years and $19.99 after that. The OEM already is recommending shops based upon location in connected cars and when customers in non-connected vehicles call Nissan for assistance after a crash. The OEM provides free tows for up to 50 miles to certified shops. The next step would be factoring in shops’ KPI-based rank when making these recommendations, Zoba said. “Obviously, we want a safe, quality repair,” he said. Zoba said Nissan will evaluate shops on six key performance indicators similar to an insurer’s but with different weightings. One emphasizes repair quality, including checking the existence of printed procedures, documentation they were used and proof of quality control during a repair, according to Zoba’s presentation. Zoba said that every Nissan-certified shop has a digital data safe to store repair documentation as part of the OEM’s collaboration with Assured Performance. But it sounds like some shops aren’t using it — which could backfire upon them if Nissan gets stricter about checking for documentation. Zoba said one of his biggest complaints about collision repairers was that they weren’t using the tools he made available for them. Some shops still are documenting their repair with paper checklists, he said. “If they’re not the right tools, let me know,” he said. Cycle time, CSI, cost, parts (Zoba said OEM parts cut cycle time and improve accuracy) and parts ordering will also matter, according to a slide from his presentation. “Yes, parts is in there,” Zoba acknowledged. But he indicated a stronger reason for the network was the complex vehicles Nissan had in the works — something those critics couldn’t know. Nissan does not restrict parts to certified repairers, with the exception of continuing to do so for the GT-R’s separate collision network, according to Zoba.